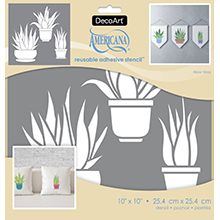 Classic adhesive-backed stencils featuring all-purpose designs. These soft and flexible stencils are designed to work on curved as well as flat surfaces. They are self-adhesive and re-usable, making them ideal for painting or glass etching projects.